JamCraft 2018 centered around creation through combination, and we attempted to meet that theme by creating an environment where you combine ingredients to make unique omelettes for each guest you serve. 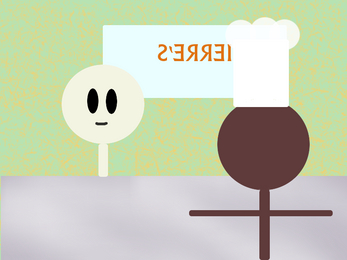 The goal of this game is to cook and plate omelette orders for customers, and to handle the constantly-increasing pressure of delivering orders to impatient customers. Unfortunately, you definitely won't be able to complete this goal because there's no plate, no order, no HUD, and no customer. We also weren't able to complete all the artwork, but it was a great experience and we'll definitely be doing more games in the future, and we will be completing this game outside of the jam - the design exists and it's just a matter of time! There's also some bonus unused artwork in there, like the classic omelette, french omelette, and southwestern-style omelette. Hopefully one day this game will use them! Download, unzip, run OmeletsGo.jar. Make sure it's in the same place as the img folder or none of the assets will load.